Colin Kaepernick, already a household name for those who watch pro football, became a household name this week even for those who don’t watch sports when the San Francisco 49ers quarterback was seen declining to stand during the National Anthem. He’s been doing it for awhile, but he’s been passive enough about it that few caught on until this week. Finally he’s being asked why – and not everyone likes his answer. But the gesture alone is remarkable, for a few reasons. When he was asked why he’s remained sitting during the Anthem before his team’s games, Kaepernick explained that he’s protesting the fact that innocent black Americans are routinely being gunned down by the police without any consequences. He seemed to have been caught off guard by the fact that the media had finally noticed; his reply seemed rushed and unrehearsed. That suggests he hadn’t been trying to make a public statement with the gesture, so much as a personal one which happened to take place in public. And while he didn’t say it in exact words, he’s essentially aligning himself with Black Lives Matter. There are a few ways to parse this development. First of all, he’s absolutely factually correct about the fact that police officers can pretty much gun down any black person they feel like shooting, and face no legal consequences. To claim otherwise is to deny reality. There is also the fact that the vast majority of police officers would never act that way on purpose, and even when they do shoot an innocent black person who was doing nothing wrong, it’s usually because they panicked. If they unjustly shoot a white person, they usually face legal consequences. If they unjustly shoot a black person, they usually walk. If anything it’s the justice system that’s fundamentally broken, particularly when it comes to juries giving a free pass to police officers whenever they shoot a black person, more so than the police force being broken itself. So Colin Kaepernick isn’t protesting over nothing. He’s picked a pressing social issue that’s becoming a crisis. Then there’s the matter of whether you agree that declining to stand for the Anthem is an appropriate form of protest, and whether you think he should be doing so while on the job with his employer. That latter part is what makes Kaepernick’s decision so remarkable. In a sport like pro basketball which is more star-driven, there are dozens of star players like LeBron James and Steph Curry (and several less famous ones for that matter) who can make a definitive statement on a social issue and be certain they’ll still have a job with their team the next day. But pro football is different. There are fifty players on each team instead of twelve, rosters are turned over more quickly, and you can count on one hand the number of football superstars who can do what Kaepernick just did without fear of reprisal from their employer. So the mere fact that this guy took a stand is a big deal. You just don’t see this in football. There are too many ways it can blow back on an athlete personally. The media loves to take a story like this, blow it up for the sake of ratings to the point that it becomes a distraction, and then turn around and blame the player for the distraction that the media just created. If the team was already thinking about getting rid of that player, it just got handed an excuse to do so. So yeah, Colin Kaepernick is risking a lot. 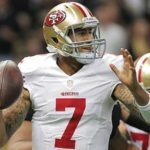 A few years ago, Kaepernick was a rising star in the league. He was one play away from being a Super Bowl winner. But after two head coaching changes in two years, his play has regressed to the point that he’s now mired in a battle just to see whether he gets to be his team’s starting quarterback. In fact that decision will be made within the next two weeks. So this guy didn’t choose the peak of his career, back when he was safe, to make his statement. He did it now, when the social issue in question is becoming a national crisis, even though he’s no longer as safe as he once was. He’s receiving criticism from those (obviously politically conservative) football commentators who are labeling him a “distraction” as a way of being able to criticize him without having to admit that they simply don’t want to admit that the issue exists. So give Colin Kaepernick credit for risking what little starpower he has left in the name of coming down on the correct side of a vital issue, whether you like his particular method of going about it or not. He’s certainly doing more to bring attention to this pressing matter than any of the conservative sports commentators who seem to think that being a good American consists of nothing more than blindly waving a flag and pretending the nation’s problems don’t exist. What have any of them ever taken a stand for?